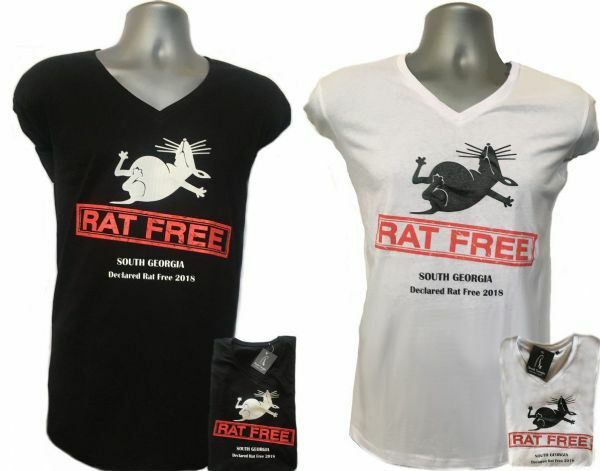 Celebrate the announcement, made in May 2018, that South Georgia is now rodent free with these fun t-shirts. Available in black or white. Mens sizing is S 36/38", M 38/40", L 41/42", XL 43/44", 2XL 45/47", 3XL 47/49"
Celebrate the announcement, made in May 2018, that South Georgia is now rodent free with these fun t-shirts. Mens sizing is S 36/38", M 38/40", L 41/42", XL 43/44", 2XL 45/47", 3XL 47/49"
These 100% organic cotton t-shirts by B&C are made of superior combed ring-spun organic cotton which is light weight yet strong and beautifully soft. They feature a v-neck, short sleeves and side seams. The option to buy a women’s or man’s style ensures a perfect fit for the feminine or masculine silhouette and the easy fit cut of these ensures your t-shirt is comfortable without being baggy.